With Jack only home for a couple of weeks, Sharon made a decision in early May that we should spent a weekend at Yosemite. Sharon and I haven't been to Yosemite since 2009. Jack has never been to Yosemite! Sharon, Jack and I took off from Carmichael about 1:30 pm. With a quick stop for gas, we got to the Rush Creek Lodge by 4:30 pm. Waze took us via Highway 99 to Highway 4 and through Copperopolis to Highway 120. 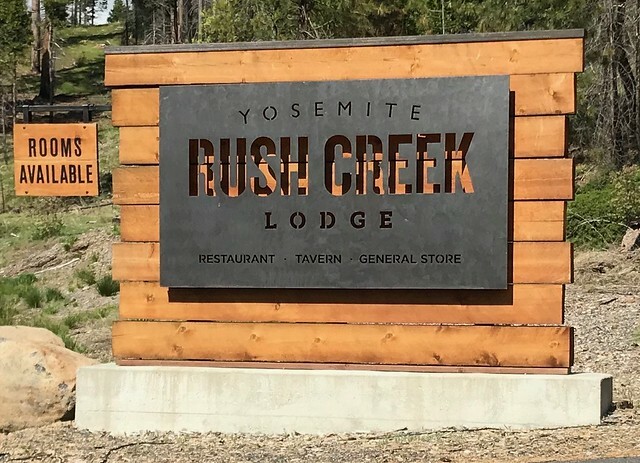 The Rush Creek Lodge is new. It opened in June 2016. The lodge is located just a mile outside the Yosemite North Gate on Highway 120. After getting settled in the room, we relaxed and played a couple of games of cribbage. We eventually wandered to an early dinner in the Tavern. Jack had a Trout BLT, Sharon had salmon and I had Chicken Curry. The lodge is set up with lots of activities and a big game room. We ended up playing three games of electronic darts after dinner. We finished the night with a trip to the hot tub.